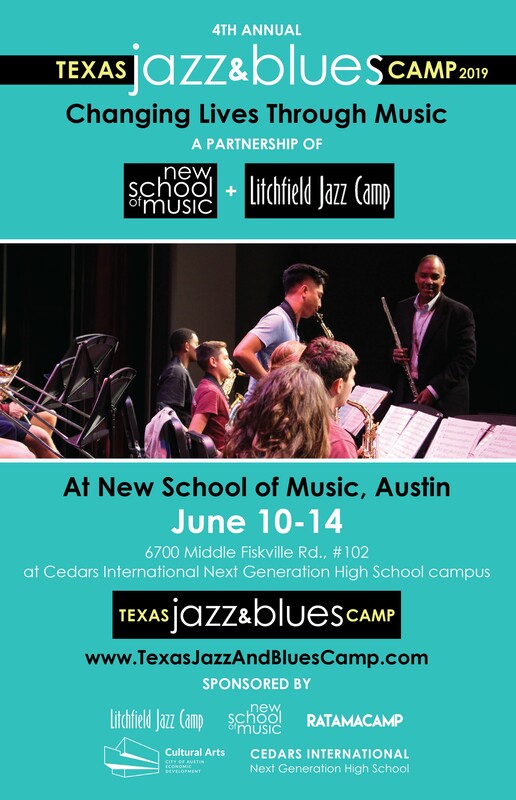 The Texas Jazz & Blues Camp is coming in June 2019 to Austin, Texas and is a partnership between the New School of Music in Austin and the Litchfield Jazz Camp in Connecticut, which has a deep and rich history of providing a top tier national jazz camp for 20 years, using major jazz artists and educators. Don Braden, world-class jazz educator and saxophonist, is our camp Music Director and has toured extensively with Wynton Marsalis, Freddie Hubbard, Tony Williams, Betty Carter, & Roy Haynes. Don is a Harvard alumnus and has served as a guest conductor for the Harvard University Monday Jazz Band for 3 years. Andre Hayward, NSM’s VP, is a renowned trombonist and jazz educator, who has toured with Jazz at Lincoln Center Orchestra, Wynton Marsalis, Chick Corea, Roy Hargrove, Betty Carter, & the Duke Ellington Orchestra. Andre has served on faculty at New England Conservatory, NYU, UNT, UT Austin, & Michigan State Univ. Texas Jazz & Blues Camp is an all-embracing program focused on musical and personal growth where our students can learn by hearing the greats on our staff and each other. While the commitment to the music is at the highest level, the program is not competitive. There is no pre-audition required. We listen to you when you arrive and assign you to a combo at your own level. Need-based and merit scholarships are available. Students are ages 10 to adult, with most in their mid-teens. Previous jazz experience is preferred but not required, as long as the student has the equivalent of 2 years’ experience on their instrument, and has an interest in learning to improvise. Groups are welcome to attend and be coached together. Instrumentalists and vocalists are welcome. Performance opportunities abound! End of day student jams are available, and the end-of-week concert features student combos and faculty. Parents, guests and Campers are welcome free of charge. Camp tuition is fully refundable for emergency withdrawals until May 1, 2019. After May 1, only 50% of the tuition is refundable for emergency withdrawals.